Black & white. Yin & yang. Light & dark. Day & night. All these contrasts form the theme in the Eclipse collection. A successor, or rather an expansion of the Intrigue collection that Arte launched previously. 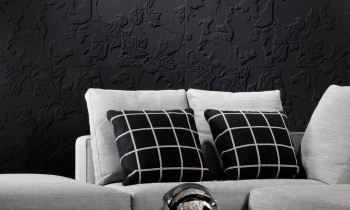 Both collections are fabric wallcoverings produced using a technique that Arte has mastered. Perhaps we can give you a hint. The technique is called thermoforming. During thermoforming, motifs are pressed into the fabric using heat. This results not only in an attractive, three-dimensional pattern that feels thick and warm, but also provides a positive acoustical effect in the room. Familiar patternsThree designs in this collection already appeared in the Intrigue collection. 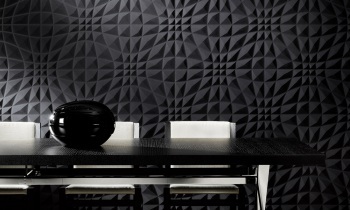 The first, Rosace, consists of triangles in relief that resemble the geometric shapes of origami. The next familiar pattern is Caisson. Unsurprisingly, it was based upon a classic French panelled door. Feuillage shows a very different character. It was modelled on nature and what you see is a lovely and fluid arrangement of leaf motifs. New patternThe first design, Flex, is a combination of geometric shapes that form a beautiful, optically challenging pattern. The relief makes the wall come alive. Charm is a classic drawing, an elegant damask motif with beautiful details. Its elegant lines look lovely combined with austere, modern design furniture. That is, if you dare. Charm also works well in a classic interior. The third and last new print is Select. 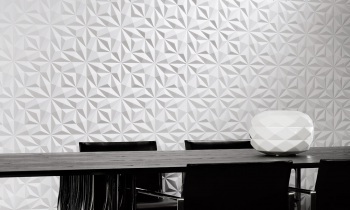 In this pattern we see tilted tiles that bring every wall to life. 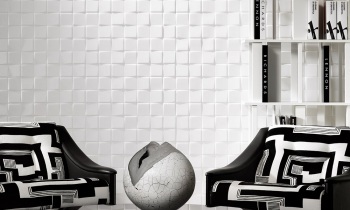 We predict that these playful tiles will be a hit. Why? Because they have it all! They are fun, beautiful, playful, rhythmic, a little bit cool and very versatile. Suitable for classic and modern interiors. Black & WhiteThe name Eclipse was not chosen coincidentally. It refers to the astronomical phenomenon when one celestial body is temporarily in the shadow of another celestial body. 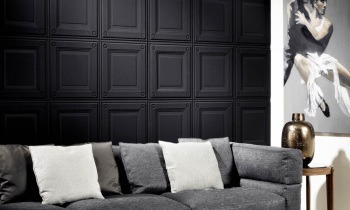 The name Eclipse suits this collection perfectly because every pattern is only available in two colours: black or white. No twilight zone. Two non-colours as it were, each other’s opposite but forever in vogue.White, the colour of innocence, is actually the sum of all colours in the visible part of the spectrum. By contrast, black is the result of a lack of light. Yet both ‘colours’ are the ideal mix and match; they are always in fashion, winter and summer.